Whenever I encounter something edible in the shape of a living creature, I eat the head first. I figure if anyone were to eat me, I would request the same treatment. I may think twice about that, though, now that I find out the baking of the Weckmann during Advent is a centuries-old custom, and the Weckmann was originally meant to represent a bishop. In the early days of the church, it was common, on Sundays and Church holidays, to give blessed, but not consecrated, bread to people who had not received the Eucharist, were not entitled to receive it (=penitents, catechumens) or were unable to receive it (=sick people staying at home). In the Greek and Russian Orthodox liturgy, this custom, which goes back to the early Christian Agape Meal (Feast of Christian Love) after religious services, has been maintained. Jews maintain this custom to this day: After the Kabbalah-Sabbath, the religious service on Friday evening at the beginning of Sabbath, all who took part in the service gather for a communal meal. Over the course of time, the pastry used during this meal took on a particular form relating to the celebration. 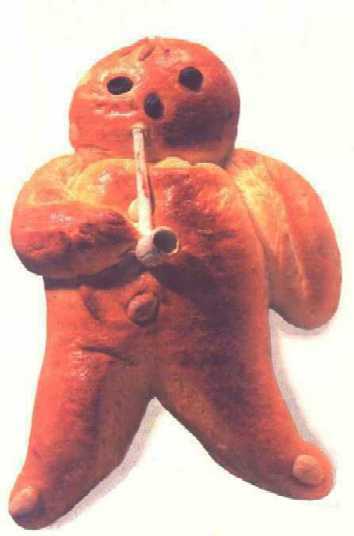 It was called “image bread.“ The Weckmann (which is called Stutenkerl or Piepenkerl in Westphalia, Hefekerl in Switzerland, and also Printenmann, Hanselmann, Klasenmann) , which was common originally only on St. Nicholas’ day, but then later also for St. Martin’s Day and now during all of Advent is an “image bread;” that is a pastry formed into a figure made out of wheat flour or dough. It is supposed to represent a Bishop! The clay pipe one usually sees today is an error: If you turn it around so the end of the pipe faces the top, you can see even today that instead of the clay pipe, a Bishop’s crozier was originally attached to the pastry. You are so cruel, LOL! I love those “Advent pastries” which are almost impossible to be found in Brazil. But surprisingly I´ve seen today in the supermarket a beautiful scented pack of dutch “Spekulaas” that brought back all my “german Christmas” memories. Bischoeffe entpuppen sich ja immer wieder mal als wahre Pfeiffen…vielleicht deswegen die Wandlung vom urspruenglichen Bischofsstab zur Pfeife der Weckmaenner? I knew my family was a prominent family in Northern and Central Germany from about 800 ad but I had no idea we were also a pastry. I will have to make it for our Weckmann/von Weckmann family get togethers. I can confirm it is eaten during St. Martinstag on Nov. 11 and also during Advent. Was delighted to have the chance to buy a Weckmann in Cologne when I went there last week.